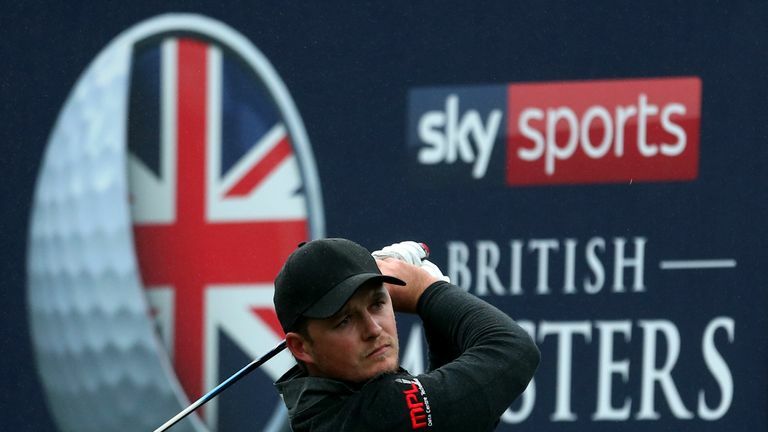 Pepperell produced a number of clutch par saves in the murky, wet conditions at Walton Heath and also holed out for his fourth eagle of the tournament at the 10th before overcoming back-to-back bogeys down the stretch, his closing 72 enough to earn a two-stroke victory on nine under par. Bjork got to within one of the leader with two to play after the Englishman bogeyed the 15th and 16th, but a wayward drive from the Swede at the last effectively ended his chances as Pepperell's par completed an impressive win and almost certainly ensured him a debut appearance at The Masters in April. Pepperell's overnight three-shot lead was whittled down to just one when Julien Guerrier holed a mammoth putt for eagle at the third, and the leader had to dig deep to keep himself in front as he scrambled pars at each of the first two holes. But Guerrier's challenge then hit the buffers when he bogeyed the fourth and doubled the next after taking two attempts to escape a greenside bunker, and the round soon developed into a duel between Pepperell and playing-partner Bjork. The Swede ramped up the pressure with a birdie on the fifth, only for Pepperell to follow him in from 12 feet to restore his two-shot cushion, although the Englishman again had his short-game to thank for another good par save at the long sixth, where he carved his second into trouble and dumped his pitch into the sand. However, after another clutch putt for par at the eighth, Pepperell finally dropped a shot at the short ninth when he three-putted from 50 feet to see his advantage reduced to a single stroke heading into the back nine. But he suddenly vaulted three clear with one swish of a wedge from the rough at the 10th, his approach from 122-yards pitching just short and left of the pin, and spinning into the cup for a spectacular eagle. Pepperell's lead could have been four had Bjork not holed from 25 feet to salvage a battling par after his second plugged in a bunker, and the Swede celebrated with a birdie at the long 11th before the Englishman missed from five feet for his four. Bjork produced another great par save at the 12th to stay within striking distance, but he then thinned his second to the 13th and lipped out to fall three behind once again. That gap looked certain to be narrowed on 14 when Pepperell carved his drive into the heather, hacked back out to the fairway and then came up short of the green with his third, but he drained an outstanding putt from 25 feet to tighten his grip on the tournament. However, his errant play from the tee was evident again as he found more trouble off the 15th tee and had to settle for bogey, and another blocked drive at the 16th left him again unable to get anywhere near the green in two. Pepperell shaved the left edge of the hole with his 15-foot par putt before Bjork, who had topped his second into the left rough, stayed one behind after converting a sublime pitch to seven feet with a confident putt, and the pair traded pars at 17 as Bjork's pushed tee shot clung to the fringe close to the run-off area. Bjork then pulled his drive at the last into the left rough before Pepperell made his best swing of the day and striped a driver straight down the middle, and although he tugged his approach into a greenside trap, he splashed out to five feet and rattled in the putt while Bjork was unable to save his par. Lucas Herbert (69) and Jordan Smith (73) ended the week joint-third on five under, with tournament host Justin Rose completing a good weekend with a 70 which earned him a top-10 finish on three under par. Ryder Cup hero Tommy Fleetwood was a further stroke off the pace after a 72 which included 16 pars, one bogey and one chip-in for birdie at the 17th, and he closed the gap on Race to Dubai leader Francesco Molinari, who finished outside the top 50 on five over.